It’s all the Republicans’ fault, explains Gov. Jay Inslee as he calls the Legislature back for a second special session. 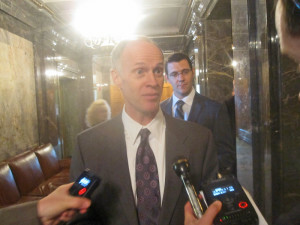 OLYMPIA, June 11.—Pointing his finger in a way previous governors never would have dared, Jay Inslee lashed out Tuesday at the Republicans who dominate the Majority Caucus in the Senate as he called lawmakers back for a second special session that begins Wednesday. The Democratic governor, in the first year of his first term, blamed Republicans for absolutely everything, saying they had failed to compromise while his own party had done everything that anyone could reasonably expect. By the time Inslee got done with his Tuesday-morning news conference, the governor made it clear that he believes truth and justice lie on the Democratic side of the aisle. And by making that statement, the governor also made it plain that he does not plan to be the above-it-all mediator who brings together the Legislature’s various factions – a role that all previous governors in recent memory have played with varying levels of success. Instead Inslee plans to be his party’s champion in any budget talks that take place at the statehouse during the next 19 days – though the level of anger displayed in Republican ranks Tuesday might make you think it is going to be some time before anyone will be on speaking terms. Lt. Gov. Brad Owen brings down the gavel to end the Legislature’s first special session of the year. He’ll be banging it again Wednesday to open a new one. And so the Washington Legislature’s first special session ended on a sour note after 30 days that actually might have been considered quite productive. Despite an apparent lack of activity during the first 25 days of the session, the Majority Coalition in the Senate and the Democrats who hold firm control of the House made significant progress late last week toward a session-ending compromise. You just might have had trouble telling, with all of the shouting that was going on. All the usual rancor that normally plays out behind closed doors has been forced to the public stage by the unusual decision last week by House Democrats to do their negotiating in the open. For those who lament the normally secretive nature of budget negotiations, the Democratic tactic has become a case of be-careful-what-you-wish-for. The decision to go public has triggered a political battle so intense that it raises the possibility the Legislature will not pass a budget by the time a new fiscal year begins July 1 – a situation that has never before occurred in Washington state. Democrats claim Republicans are intent on pitching the state over a “fiscal cliff” in a deliberate effort to shut down state government – the kind of nastiness for which the Other Washington is known. And while members of the Majority Coalition in the Senate say that idea is poppycock, they fear the Democrats are setting the stage for disaster in order to score a political victory – risking state government itself to do it. It has become a case where the political arguments have begun to overshadow the relatively minor differences that remain between the two chambers. So here’s how those very public political arguments are shaping up. 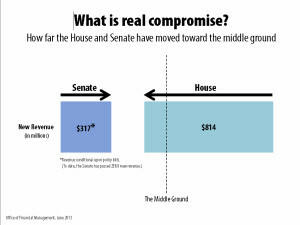 Chart provided by Inslee’s office shows governor measures compromise in terms of budget alone. Inslee’s news conference Tuesday featured an argument worthy of Congress. The governor, who served seven-and-a-half terms in the U.S. House before returning to the rather more genteel statehouse this year, declared that Republicans are ignoring the state’s fiscal problems as they push a disturbing “ideology” of state-government reform. And to underscore that point, Inslee used the words “ideological” and “ideology” an astounding 19 times during the course of 30 minutes. “I am concerned about this obvious effort to use children as a lever by the Republican Majority Caucus to get their ideological [position] rammed through the Legislature,” the governor stated. The governor’s point is that taxes need to be raised in order to meet a new mandate from the state Supreme Court, requiring the state to spend significantly more money on K-12 education. In a year when the state will have about $2 billion more to spend for 2013-15 than the last time it wrote a budget, it appears both sides are happy to spend big on schools. The Democrats would spend about $900 million to meet the court mandate, the Senate Majority, about $1 billion. The hitch is that while the Senate is willing to accept some new taxes – not as much as the Democrats would like – they are also insisting that a now-rather-short reform agenda be passed at the same time. Inslee says Democrats have compromised enough already – they originally proposed a much larger tax increase, but they cut their proposal roughly in half last week. So the governor says Democrats shouldn’t have to deal with the Republican reform bills in order to get the taxes they want. “The Senate Republican Caucus is going to have to get off its ideological bandwagon and get onto efforts to find an educational funding package that needs to happen,” Inslee said. Inslee’s blame-one-side approach is without any recent precedent. Last time the state lurched toward the brink, in 1991, in a situation very much like the current one, then-Gov. Booth Gardner declared Republicans and Democrats shared the blame, and he did all he could to bring both sides to the table. Gardner pointedly warned his own party of the consequences. But what happened after Tuesday’s news conference demonstrated that Inslee has no plans to play the conciliator; instead he hopes to lead his fellow Democrats into battle with the Senate majority, and he plans to win that fight sometime before June 30. 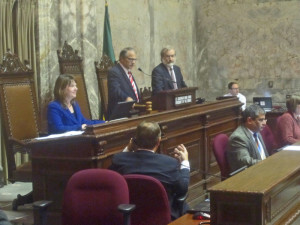 Inslee popped in during the closed-door Democratic caucus meetings that were taking place in the House and Senate, where members had been watching the news conference on television, and at each of them his fellow partisans greeted him with cheers. 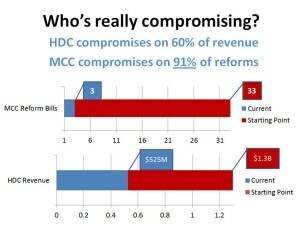 Senate Majority Coalition Caucus offers a chart of its own, showing it measures compromise in terms of budget and reforms. Whether one side is more just and righteous than the other is a matter that can be decided only by politicians, newspaper editorial writers and ultimately the state’s voters. But it is worth noting that in terms of dollars the budget dispute is now a pretty small one. If you consider the moves made in the last few days by both sides, the House and Senate are now only about $200 million apart. That is about one-half of one percent of a budget that will wind up somewhere around $33.5 billion, give or take. There are some big differences in spending priorities, of course, and in the way the budgets are structured. Yet none of those differences can be considered out of the ordinary. 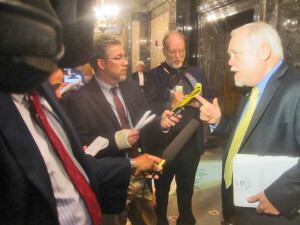 Similar disputes occur every time the Legislature writes a budget, and cool-headed lawmakers usually find ways to resolve them. The claims of fairness and unfairness are a little different than usual, however, because normally they are not aired so publicly and so loudly. The ironic thing, however, is that every yelp of injustice made by one side can be countered by the other. For instance, Inslee and the Democrats are claiming that the Republicans are trying to hold the budget hostage for reform bills. But it also can be said that the Democrats are holding K-12 spending hostage for tax increases, because $200 million of the $900 million they propose spending on the K-12 court mandate is tied to a highly controversial bill that would narrow or end a series of tax exemptions. Where Democrats say the Senate Majority Caucus is insisting on government reforms as a matter of “ideology,” the other team says the same thing about the Democratic insistence on tax hikes. And Inslee isn’t the only one who claims children are being misused in the debate: “I think it is despicable the way that the Democrats who control the House of Representatives have tried to extort tax increases out of the Senate by holding children hostage,” state Sen. Don Benton, R-Vancouver, told reporters Tuesday. As for the claim that the Democrats have done all the compromising they need to do, and that there hasn’t been much give from the other side – that also is largely a matter of rhetorical debate, and it starts getting downright nitpicky. The Senate Majority Coalition says it already accepted plenty of tough-to-swallow Democratic priorities when it crafted its own budget proposal, including the public-employee union contracts negotiated by the Gregoire Administration, the expansion of Medicaid programs under the federal Affordable Care Act, and the extension of a hospital bed tax. And then, on the Democratic side, there are some who argue that it is unfair for the Senate majority to insist on policy bills, because there were a number of House Democrats this year who wanted to pass a gun-control measure, apparently an insufficient number, but there might have been enough votes to pass an abortion bill in the Senate if only the majority had allowed it. And so on. And on. Thus the arguments proceed, getting ever-smaller, each injustice matched by another, until finally they reach the microbial level. But as always, it comes down to a matter of leverage at the statehouse; when lawmakers have it they use it. More important is the fact that Inslee’s decision to participate in the argument means no one is above the fray. Meanwhile, comments from leaders of the Majority Caucus Tuesday suggested they made a subtle move toward compromise over the weekend that went unnoticed at the time. State Sen. Don Benton, R-Vancouver. On Sunday, the Senate debated and passed three reform measures. It was a symbolic act and nothing more, because all three measures had been passed by the Senate once already this session, and the rules of the Legislature will require them to be passed again if they are to be considered during the second special session. But the vote did stake out the Senate’s position. One bill would expand a structured settlement program that aims to reduce the cost of the state workers’ comp program. Another would give principals the ability to decide which teachers can teach at their schools, driving a wedge into union contracts that now base teaching assignments on seniority. And a third would limit the growth of non-education spending while pumping more money into education, thus reducing the pressure for tax increases in the future. The three bills were among 33 reform measures passed by the Senate this year that House Democratic leaders refused to advance. The presumption all along was that they would be considered as part of the Legislature’s “endgame.” The question at this point is whether the Senate has narrowed its focus to just those three bills and has dropped the other 30. Leaders of the Majority Caucus aren’t answering that one directly – it is a matter of negotiation, they say. But Senate Majority Leader Rodney Tom, D-Medina, told reporters Tuesday that those three bills are the most important expressions of the Senate’s top three priorities – jobs, education and sustainable budgeting. “You look at those three reforms, you have one on jobs, as far as workers comp goes; you have the education reform and you have the sustainable budgeting, so it is very much in line,” Tom said. Senate Majority Leader Rodney Tom, D-Medina. Tom says the posturing has become a bit much over the last few days, but of course no one is interested in shutting down state government. “It is complete nonsense and we’re not going to let it happen,” he said. Essentially Senate leaders are arguing that compromise ought to be measured in terms of more than just the budget. 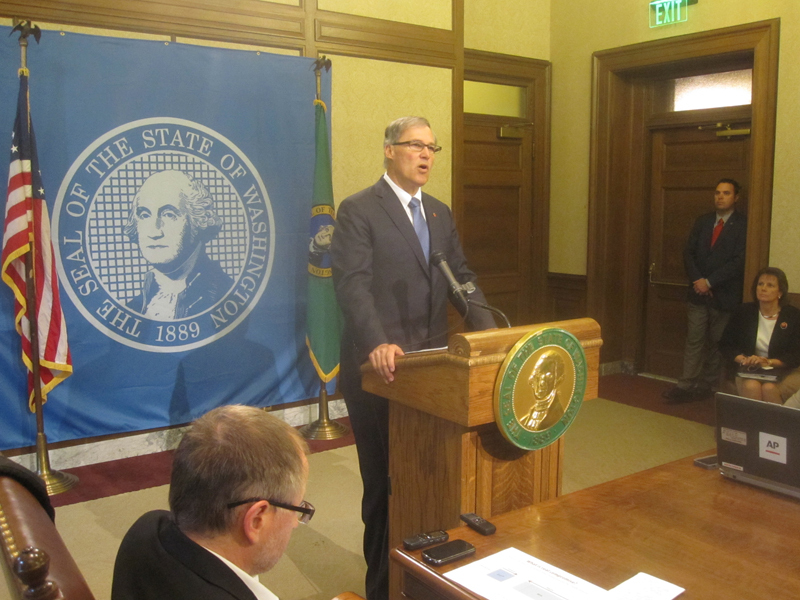 But at Tuesday’s news conference, Inslee said the session-ending debate ought to be about taxes and spending alone. His staff circulated a chart demonstrating that the governor reduces the argument to the very simplest level. It showed that Democrats have offered to reduce their original proposal for a little over $1.3 billion in tax increases by $814 million. The Senate majority has offered to come up from its original no-new-tax stance by $317 million, and only if the reform bills pass. Inslee said he believes the Senate should drop the reform bills and raise its offer to a point where it meets the House halfway. “It is unfortunate that the necessary compromise has not been shared on a balanced basis,” he said.